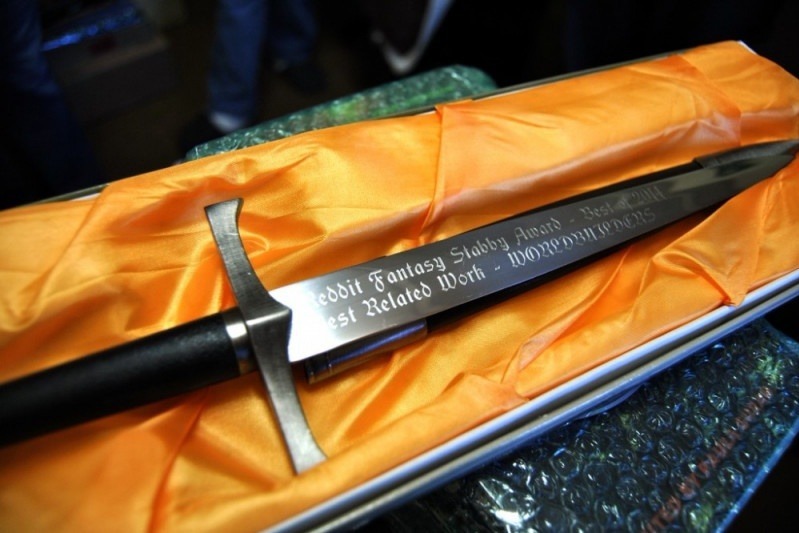 The r/Fantasy Stabby Awards started in 2013 as a 'best of' award for the reddit r/Fantasy community. The awards are a token of appreciation - given to speculative fiction and related categories. Average Stabby price is $40-45 depending on whether it is US shipping (cheaper) or international. We shipped fewer Stabby Awards in the past due to the cost. Our goal in the past few years has been to give each external winner a Stabby and, due to funding, we were able to ship to everyone! Same goal for this year - ship every external winner a Stabby. That may include 2+ Stabby Awards for a collaborative effort or it may mean sending a Stabby to a movie studio where it might (or might not) get lost in the shuffle. We'll not waste a Stabby, though. Please do donate a little. As a crowd we can fund this one pretty quickly. For more info, google up 'Stabby Award' and go through the multiple sites that cover our award. And those who appreciated receiving one!